Most float trips start with a visit to a local eatery and ours was no exception. 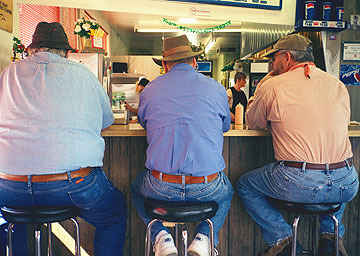 Richard C. introduced Dave Black, J.C. Poulton, and me to "The Big Burger" in Redding where we fortified ourselves for the upcoming rigors of fishing the lower Sac. I had felt a fair amount of anxiety prior to the trip because the water released from Lake Shasta had doubled just 4 days earlier. All my concerns disappeared, however, when we arrived at the launch ramp at the Posse grounds. The water was crystal clear and hordes of caddisflies hovered near the riverbank foliage. The quality of fishing we were about to experience was apparent from the begining. I hooked my first trout on the first cast in front of the ramp and proceeded to lose the fish. Rich and I landed 5 trout during the first 20 minutes of the trip, all within 50 yards of the launch ramp. Those 5 fish ranged from 18" to 24" and two were caught during a double hook up. The action continued with the same intensity all day long. We fished until 5:30 PM and were never without a fish on for more than 10 minutes at a time. The setup was very simple. No tapered leader was used! A 9 foot section of 3X fluorocarbon tippet was tied directly to the floating line. The working end of the 3X had a #14 prince nymph. Two feet of 4X fluorocarbon with a #16 flashback PT was added to the prince nymph. An enormous strike indicator, the size of a ping pong ball, held the whole contraption aloft. Personally, I was impressed by the effectiveness of fishing from a drifting boat. 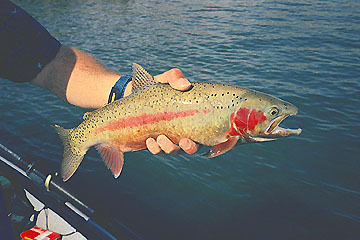 Basically, drag, the curse of all fly fisherment, is a non-issue from a boat. You simply cast about 35 feet of line, throw a couple of upstream mends, and you're set for about a 5 minute drift. The fly is straight below the indicator and the takes are very obvious. The section of river we floated is loaded with trout. It seemed as though every time I looked to the rear of the boat Rich was wearing a grin from ear to ear and his rod was doubled over. And every time we passed JC's boat Dave Black was hollering about something over the sound of the rushing water. Although I haven't brought up the subject yet, I noticed Dave taking part in an unusually high number of long distance releases. Speaking of long distance releases, I had one of my own which I won't soon forget. As we drifted the head of a run my fly just stopped. I put pressure on the fish and the slow deep bends in the rod spelled size. I immediately reeled in all the loose line and continued the fight from the reel itself. We sparred a bit and the rainbow began to understand the situation more clearly. He started a run across the river causing the full force of the Sacramento to drag on the extended line. And then the size 16 PT came out. I was ready for the rubber room. 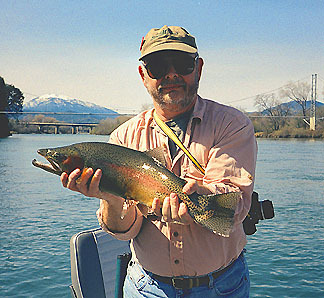 Rich and I had each caught a 24" trout that day, but this fish felt significantly larger. At the end of the day I was asked whether I felt tired. Yes I was tired, but it was fatigue that was welcome. I inquired about the number of fish caught. My companions proudly anounced that they didn't count fish because it somehow diminished the experience. And so, dear reader, I can't tell you exactly how many fish were caught. My estimate is that each boat landed about 25 trout during 4 1/2 hour of afternoon fishing. One final note about a guided trip on the Sacramento. If you are after big trout that pull hard this is the trip for you. There is probably no place in California quite as good. On the other hand, if you are looking for challenging trout that require stealth and attention to detail, such as the Henry's Fork, then go elsewhere. Most of us want both.